This Tommy Hilfiger bracelet watch supplies a stylish look for a sophisticated gent. The contrast markers work well against the round, 40mm blue dial while the brown leather strap will secure the watch in place. 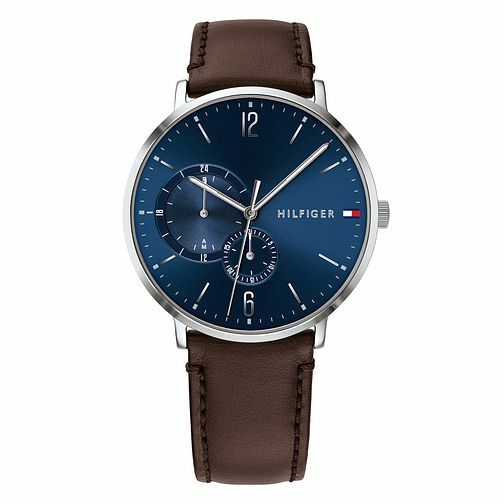 Tommy Hilfiger Brown Leather Strap Watch is rated 5.0 out of 5 by 2. Rated 5 out of 5 by Anonymous from Product is perfect Very quick efficient website and product arrived two days after purchasing online during a busy period. Very happy with the product. Rated 5 out of 5 by Anonymous from Product looks good brought as a Christmas present Can’t wait to give as a Christmas present !!! Site is easy to order and will definitely purchase again !! !